Their unblemished image and revolutionary life will live on in the hearts of all true patriots and communists as a lofty example of inspiration, a call to arms in the struggle against the bloodthirsty bourgeoisie and reaction"
Some weeks ago, comrade Pedro Pomar, Member of the Executive Commission of the Central Committee of the Communist Party of Brazil, together with his brave comrades, Angelo Arrojo and Juan Battista Drummond, fell heroically fighting the fascist dictatorship of Brazil. Comrade Pedro Pomar was an outstanding leader of the Communist Party of Brazil, an indomitable fighter against imperialism, modern revisionism and fascist reaction, a dear friend of socialist Albania. Comrade Pedro Pomar was three times in our country and cherished a great love and respect for the Party of Labour of Albania, the Albanian people, and their struggle against imperialism and revisionism, for the defence of Marxism-Leninism and the construction of socialism. 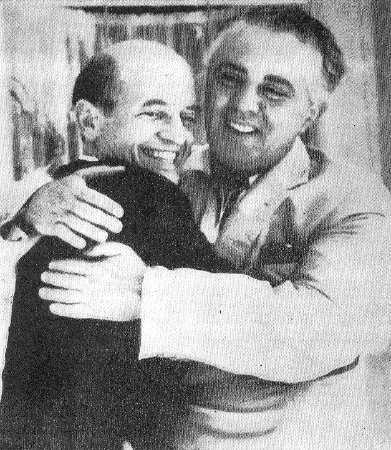 As a mark of honour and respect to the memory of comrade Pedro Pomar we publish below excerpts from a conversation comrade Enver Hoxha had with him when he visited Albania on August 18, 1967. Comrade ENVER HOXHA: How are you, comrade Pomar? How is comrade Amazonas? Comrade PEDRO POMAR: Thank you, we are well, all of us are well. Comrade ENVER HOXHA: It is a great pleasure to meet you, comrades of the heroic Communist Party of Brazil, again. We have the best recollections from the meeting we had with comrade Amazonas when he was in Albania. Comrade Amazonas is a very resolute fighter for Marxism-Leninism, a capable man, strong in his spirit and thoughts, as well as in his correct interpretation of Marxist-Leninist knowledge. All our comrades were extremely pleased and considered it a great honour that comrade Amazonas came to attend the 5th Congress of our Party. On that occasion he and the other comrades gave us a clear picture of the situation in Brazil and Latin America. This was of very great help to us. We know that the two sides, both you and we, need to exchange opinions with each other, therefore your coming to Albania is of help to us. Comrade PEDRO POMAR: Your words, comrade Enver, arouse very deep emotions in us. They are very warm and cordial. Whenever we have come here we have been very happy and ready to exchange opinions with the Albanian comrades. Comrade Amazonas left your country very satisfied and with the best impressions about the comrades of the Party of Labour of Albania, and even more convinced of the correctness of the line of your Party. Standing in the forefront of the struggle against imperialism and revisionism, the Party of Labour of Albania has given us the great example that, basing oneself on Marxism-Leninism, one can successfully face up to any enemy, not matter how powerful. Being united and closely linked with each other, no one can defeat us. Therefore, in the name of all our comrades, we greet you warmly and assure you that we will always be your true brothers. Comrade ENVER HOXHA: You make a very high assessment of our Party, Comrade Pomar. Your words strengthen our confidence in our common struggle, they enhance the sense of the responsibility our Party has towards the international Marxist-Leninist movement. Of course, our experience is not very great, nor is it the only one.We do not say this out of modesty, but proceeding from the truth that the struggle and the revolution are the great common cause of all the peoples, about which immense experience has been accumulated and is still being accumulated, which shows that only those parties that implement Marxism-Leninism consistently can carry out the revolution and make it triumph. But where does the strength of the Marxist-Leninist parties lie? It lies in the fact that they always look at life as it is, with its contradictions and zigzags, its tendency to perpetual advance, its inevitable progress through the revolution. This confidence in the future enables the Marxist-Leninist parties to orientate themselves correctly in their struggle, makes them unafraid of difficulties and means that they do not despair because of temporary setbacks, because Marxism-Leninism teaches us that the road of the revolution is not strewn with roses. Therefore, the Marxist-Leninists should lead with indomitable courage and. determination, overcome all difficulties through struggle and efforts and, in the process of this struggle, gather the experience that will enable them to forge further ahead. Over its course of 25 years, our Party has learnt a great deal, but we see that we still have more to learn. Now we are implementing the decisions of the 5th Congress of the Party, and I can tell you briefly that we have achieved successes in implementing the line of the Party. This does not mean that we are not encountering difficulties, but the question is that those difficulties, no matter how great, are being rapidly overcome in the situation created by the Party, because our Party, like your party, is closely linked with the people, and its line represents the wishes and aspirations of the working people. On the other hand, it is working tirelessly so that the people understand, feel, and carry out the line of the Party, Marxism-Leninism, and interpret all the phenomena and the directives of the Party in the Marxist-Leninist spirit. We see that the implementation of the directives of the Congress of the Party has brought results. The principal result is the high level of political consciousness of the communists and people, which is expressed in the fulfilment of our economic plans as never before, whether in industry, agriculture, education, culture, or in the question of the defence of the Homeland. In regard to the great common fight against imperialism as well as modern revisionism, also, we consider that we should never be satisfied with the successes we have achieved, for the reason that there is still a great struggle ahead of us. Even if some results have been achieved in Albania, and the main result is the establishment and strengthening of the dictatorship of the proletariat, we must never forget that our comrades and the other peoples are fighting and shedding their blood, are making colossal sacrifices and going through innumerable hardships in extremely difficult internal and external circumstances. Therefore, we must not only assist them, but must also understand them, and have great trust in our comrades, in their heroism, struggle and Marxist-Leninist maturity, and never jump to erroneous conclusions and claim that someone is in a position to show off and issue ready-made prescriptions for others to act in this way or that. This is not at all Marxist-Leninist. The comrades know the situation in their own countries very well. They know the situation and the mentality of their own people best. On the basis of this knowledge and being guided by the principles of Marxism-Leninism, they are in a position to educate and mobilize the party, to throw it into struggle and march ahead. This question is connected with the understanding and implementation of the Marxist-Leninist theory on the basis of the concrete situation of the country. Someone may .say that you may make mistakes. But where is that party, big or small, old or new, which has not had shortcomings and made mistakes in its work? The important thing here is not to conceal them, but to recognise them, to analyse and correct them on the basis of Marxism-Leninism. This is Marxist dialectics. Hence, we learn from our struggle and our mistakes. If a people or a party do not struggle that party and people have no history. History is not made without struggle. As you know, we face many enemies, imperialism led by U.S. imperialism and the modern revisionists headed by the Soviet revisionists, who are very cunning and have great experience. But no matter how great our enemies' cunning and means, they haven't our strength, for our strength lies in the Marxist-Leninist ideology, in our confidence in victory, in our faith in the people. The people are with us, because the future, the truth is with us, but we must know how to educate the people for this future, how to organize and enthuse them, and then we shall certainly triumph over the enemies. Now that China is carrying out its Great Proletarian Cultural Revolution, we must support it, for this revolution has great importance not only for China, but for the entire world revolution. This revolution is one of the forms that the Communist Party of China and comrade Mao Tsetung have found to smash the revisionist group of Liu Shao-chi, which had managed to infiltrate its line into the Party and the socialist state. As you know, the Soviet revisionists have launched a furious attack on Marxism-Leninism and the revolution in general, because their positions are growing weaker and weaker while ours are becoming stronger. And we do not say this for nothing, but judging from the concrete situation. The Soviet revisionists have become the most shameless allies of U.S. imperialism. But why has this come about? Because they are in the position of traitors and cannot do otherwise. Why are we the stronger? Because the Marxist-Leninists of the entire world did not allow the Soviet revisionists to disguise themselves, but forced them into a corner and denounced them openly as agents of the bourgeoisie, which the communists and the masses of the working people all over the world are seeing more and more clearly with each passing day. Their exposure led to the exposure of the revisionists of all the former countries of people's democracy as well. The contradictions between the Soviet revisionists and the revisionists of the former countries of people's democracy of Europe were made more .profound. Such is the situation in general. But, despite the successes the Marxist-Leninists have achieved, we still have a great deal to do. Our help, about which you spoke, comrade Pomar, is modest, but, as Marxist-Leninists, we shall help each other with all our strength. We have great admiration for the Communist Party of Brazil, the Central Committee of your Party and comrade Amazonas. The fact that your Party is in a correct revolutionary position is of great importance, also, for the entire Marxist-Leninist movement and the revolution in Latin America. We have contacts with the other Marxist-Leninist parties of Latin America and are sure that, despite the difficulties they encounter, the Marxist-Leninists will overcome them through their struggle. The important thing is that the Marxist-Leninist parties of Chile, Colombia, Bolivia and so on should succeed in taking control of the situation in their own countries. Comrade PEDRO POMAR: Thank you very much for all that you have said, comrade Enver. I am deeply moved by your very warm and cordial words and the opportunity you have given me to listen to you personally once more. Today you have given us a general outline of the situation in Albania. I have been in your country four years ago. During this period you have passed through difficult circumstances. With this I do not imply that there are no difficulties now, but, since then you have made evident progress. The successes you have achieved are exceptionally great. The results you have achieved from the political and ideological viewpoint are such that the capitalist countries of the world could not achieve in centuries. Many capitalist countries may be more advanced economically, but this is not the main thing, for the peoples of these countries are oppressed and exploited, and this economic development itself is not in the hands of the people, but in those of the bourgeoisie. Whereas in your country the political situation and the morale of the people is extremely enthusiastic. And there is no doubt that all these victories are due to the correct leadership of your Party, to Marxism-Leninism, to your Party's loyalty to Marxism-Leninism, to the great unity of the people with the Party. Indisputably, all this is a great encouragement for us to advance still further ahead in our struggle. Therefore, we shall struggle even harder against our enemies who are, at the same time, the enemies of the Albanian Party and people. The further revolutionization of the country, which the Albanian people are carrying out under the leadership of the PLA, has great international significance. Indeed, I can tell you that it is reflected in our country as well. A few years ago our people had never heard of Albania and knew nothing about it, while now they know about and are showing continuous interest in Albania, learning about and rejoicing at the successes of the Albanian people. The people know that, in Albania, the revolution is going on uninterruptedly and with sure steps. So much so that this year even some bourgeois newspapers have been obliged to write about Albania, to publish news and informative articles on the courageous and independent stand of the Albanian comrades. It is the facts that make Albania known all over the world. We think that Albania is forging ahead successfully. We are in complete agreement over the problems you put forward at the 5th Congress of your Party. It is not in the least accidental that all the Marxist-Leninists respect and visit Albania. The revolutionary peoples consider Albania as a bastion, a citadel of their liberation struggle, as the vanguard of Marxism-Leninism. Comrade Mao Tsetung's message addressed to the 5th Congress of the Party of Labour of Albania should be applauded by all when it says that, “Albania is a great glowing beacon of socialism in Europe”. On this occasion we want to stress that your assistance to us has been exceptionally great. We are extremely grateful for it and will do everything possible to make our contribution, too. At present the bourgeois propaganda is having a great deal to say about Latin America being one country, whereas in reality our states are very much divided among themselves, not only by their interests as separate capitalist states, but also by national interests. But the Marxist-Leninist parties of Latin America have a common task, especially in the struggle against U.S. imperialism and revisionism. Now a situation has been created that calls for the coordination of all our forces. We must get a thorough grasp of this situation, because the difficulties which the Marxist-Leninist movement is experiencing in Latin America are great, for, apart from U.S. imperialism, the bourgeoisie and all reaction, the revisionists, too, are fighting against us. The anti-imperialist and democratic movement in Latin America has suffered heavy blows in recent years. In these conditions we have to cope with the attacks of U.S. imperialism and the revisionists, the Soviet-U.S. collaboration, and local reaction. All this creates a difficult situation for us. Following the coup of 1964, the U.S. imperialists have taken over all the key positions in Brazil. A government totally subservient to U.S. imperialism seized power there, because, though the government in power up till then was one of the big bourgeoisie and the landowners, it defended some national interests. Whereas now the problem is quite different. The people understand that a new, grave situation has been created in Brazil, but the bourgeois and revisionist parties have worked and are working to create illusions among the people, telling them that “the Marxist-Leninists exaggerate the problem when they accuse imperialism of neo-colonialism, for there is no danger of this happening!” etc. etc. We must cope with these problems, because they are fostering illusions among the masses, the people are being misled, so that they are unable to understand the grave situation created as a result of the coming to power of the reactionary pro-American government, quickly and correctly. Before us stands the great task of making things clear to our people, of opening their eyes to the truth, and arousing them in the armed struggle to ensure national freedom. Even the representatives of the bourgeoisie did not understand the new situation that was being created in Brazil. Thus Brizola, the brother-in-law of Brazil's ex-president Goulart, although a man of great prestige, did not make a stand at the time of the coup, but fled abroad, allegedly to stage a come-back. In fact, he had not understood the situation that had been created in Brazil. The Americans saw that these politicians of the nationalist bourgeoisie were no longer useful to them, so they threw them out and brought to power instead those whom they had trained as officers for many years in the USA. This shows that they want to maintain the fascist dictatorship in Brazil by force of arms in order to have it as a reliable support and to utilize it in carrying out their neo-colonialist plans in the other countries. In fact, Brazil sent armed forces to participate in the occupation of San Domingo, This is the first time that our country's army has been sent to fight in another country. We have denounced these events and are working to convince the masses that they must struggle against U.S. imperialism; we are exposing the treacherous role of the Soviet revisionists, because not only have they recognised the reactionary government in power, but they have also concluded several trade agreements with it. As regards the Brazilian revisionists, their situation is worse than before. They have suffered a great defeat. Prior to the 1964 coup they were in a favourable situation, because the Goulart bourgeois government supported the revisionists' policy, but experience showed that this policy, acceptable to the bourgeoisie, was a sham through-and-through. After the coup d’état, we strengthened our positions considerably, because we showed the people that only Marxism-Leninism defends their interests. Our Party emerged with great influence. The revisionists, however, are merely pinning their hopes on illusions, pretending that democracy can be re-established without armed struggle, and as a result their political activity is very weak. Now they have split into several groups. One of them is on a course bringing it closer to us, because it is for the armed struggle, but at the same time it maintains a centrist and opportunist stand. Another group is a group of adventurers and party liquidators. Then comes the Prestes group which is greatly weakened and with all the characteristics of a group completely in the service of the bourgeoisie. At present the position of the reactionary clique in Brazil is shaky and unstable. The country's sovereignty is in the hands of the Americans. The principal forces of the country, the working class, the peasantry and the petty-bourgeoisie, want progress and the economic development of the country, because the standard of living of the people is miserably low, all the assets, the mines and the land are in the hands of the Americans. The peasants not only have no land but they have become even more impoverished. The dictatorial regime has completely liquidated those few victories that the working class had previously managed to win; it is becoming more impoverished, day by .day. The desires of the people for education and culture have been upset, a cultural terror has been established, the programs in the universities are adapted to the interests of the Americans, etc. All these things have sharpened the contradictions, and in practice if good work is done, there are excellent prospects for the development of the armed struggle. As Stalin said, in today's conditions the duty devolves on the communist party to raise the banner of national independence and democratic freedoms and, utilizing all the profound contradictions which have been created, to prepare for armed struggle. Comrade ENVER HOXHA: Your exposition, comrade Pomar, has added more to our knowledge of the situation in Latin America and in Brazil in particular. We consider that your Party has made a very correct analysis of the situation in Latin America in general and in Brazil. We are convinced that such a serious analysis is a great assurance of the correct development of the revolution. Revolution is a very serious matter, and once you have embarked on it you must carry it through to the end. The Marxist-Leninist cannot go about it as the bourgeoisie, the anarchists, the putschists do, for the revolution has to do with the life and the future of the people. On the basis of your party's Marxist-Leninist analysis you will know how to determine the measures you must take for the development of the revolution, taking into account all the minuses and pluses. A good understanding of the situation also gives you the possibility to take the appropriate political and organizational measures, to create alliances and to interpret these alliances in the light of Marxism-Leninism, harbouring neither petty-bourgeois illusions nor sectarian concepts. Therefore for your Party, for our Party, especially for the new parties and any party that is determined to carry the revolution through to the end, the steeling of the party is of prime importance. I say this because such a thing has happened to us. But when the situation is looked at objectively and the necessary measures are taken to attain the objective decided, everything will come about in its own time. Of course, once begun, the revolution must be carried through to the end without fail. But those who want to accelerate the development of events artificially are lacking in correct Marxist-Leninist judgment, because the revolution is not organized and carried out in one day. It is not a wedding party, but a great people's war and, in war the enemies attack with all their savagery. However, the Marxist-Leninists are not afraid to fight, although they may suffer temporary defeats; on the contrary, in war and revolution they become stronger and more indomitable. Therefore, the line of your Party is correct. The correct struggle of the Marxist-Leninist parties of Latin America, like yours, we think, is of great importance for the creation of a correct concept about the revolution there. If I am not mistaken, Latin America has putschist traditions, but there must be a break with these traditions because all the anarchist adventurers that pose as Marxist revolutionaries base themselves on them. If the Marxist-Leninist parties do not make this question clear, we think that the anarchists, who come out with “ultra-Marxist” slogans, will do great harm to the cause of the revolution, because there are people who equate a putsch with the revolution and engage in adventures, calling on the people to take to arms at a time when the conditions for this have not been created. Your Party, which has a correct Marxist-Leninist line, is educating people to understand what revolution is, who should take part in it, and who should lead it. A new Marxist-Leninist party should not be disturbed by the fact that, initially, it does not have the necessary strength and authority, but on the contrary it should be thinking about how to strengthen its work and, on the other hand, how to secure its allies. Perhaps it may be weak, not well-organized, and still have little influence among the masses, but this should not make it sectarian and avoid contact with those to whom it can explain things, win them toits cause and throw them into struggle. At the same time, this party must not efface its individuality, enter every sort of front and destroy itself. On the contrary it should always preserve its independence, principles and norms. It must, without fail, ensure its hegemonic role in the revolution through struggle and its correct policy. For the revolution to be crowned with success it must be led by its Marxist-Leninist party, but no one will give you hegemony: it must be won. Our opinion is that the Marxist-Leninist parties of Latin America, such as your Party, those of Chile, Bolivia and Colombia, etc., are very important factors for the revolution. In general, that is what I wanted to say, comrade Pomar. Our opinion is that the revolutionary struggle is making progress and that successes are being achieved. All of us have scored successes. The struggle, pressures, intrigues and blockades, which the imperialists and revisionists have perpetrated and are perpetrating, do not frighten the revolutionaries. Right is on our side, the peoples are with us, our cause will certainly triumph. As regards contacts and relations between our parties, I assure you once more, that the Party of Labour of Albania will always stand by the Marxist-Leninist parties and forces, will always assist and help them in their just struggle, it will always fight shoulder to shoulder with them, consistently and unflinchingly, for the great cause of Marxism-Leninism, the revolution and socialism. Please convey our most ardent greetings to the comrades of the Communist Party of Brazil! May you always score successes in your struggle.